Elizabeth Gabay, Rosé: Understanding the Pink Wine Revolution (Infinite Ideas/Classic Wine Library, 2018). Reviewed by Sue Veseth. Once upon a time, “proper” rosé was French, very pale pink, dry, served young and fresh, and not serious. Today, rosé is serious. Consumers can find rosé from all over world; from the palest pink to almost red in color; made from grape varieties that may be familiar or unfamiliar; made in a variety of styles and sweetness levels; and that range from simple to complex. How is a wine drinker supposed to navigate the world of rosé? A good start is Rosé: Understanding the pink wine revolution by Elizabeth Gabay, MW. This comprehensive study of rosé will open your eyes — and your palate — to the infinite variety and pleasure of rosé. Her book covers the liberal arts of rosé: history, geography, science, political science, economics, art, and literature. It is impossible in the wine business these days to dismiss rosé, as Gabay makes clear in the chapter of her book on the business of rosé. In the United States, rosé is the fastest growing category and is now a year-round option, not just a summer wine. And, like it or not, what happens in the U.S. wine market can affect wine production worldwide. Gabay describes her book as a journey of exploration, and she transmits this journey for both the serious wine student and the casual consumer. An early chapter on viticulture and winemaking, for example, has a lot of detail for the science-minded and is also accessible to the more casual reader. Similarly, her discussions of rosé from various parts of the world are presented in detail, with specific examples from the region. More maps would be helpful for the novice rosé drinker. Rosé: Understanding the pink wine revolution is a valuable addition to the library of any wine lover who is ready for a journey of exploration. Rebecca Gibb, The Wines of New Zealand (Infinite Ideas/Classic Wine Library, 2018). Reviewed by Mike Veseth. Rebecca Gibb’s The Wines of New Zealand is “designed to provide a comprehensive overview of the New Zealand wine scene,” according to its author, “a reference for locals, international visitors and students alike.” Gibb gets it right on all counts — what a great resource for anyone who wants to learn about New Zealand and its wine industry. The book’s 300+ pages are packed full of stories, personalities, facts, and figures. The organization is conventional: history, climate and grapes first, then a survey of the regions (10 of them, which will come as a surprise to those who only know Marlborough and its Sauvignon Blanc), then a final pair of chapters on tourism and current issues. Gibb’s mastery of this material is easy to appreciate, but it is her contagious enthusiasm that comes through most clearly. A chapter on grape varieties could easily become mundane but not here. Each grape is an excuse to talk about history, geography, vine science, and to introduce or reprise some of the noteworthy characters who shaped Kiwi wine history. What do I like best about this book? The sense of energy and dynamism that permeates it in both style and content. The story of New Zealand wine is a story of change, starting from the early British and French pioneers through the Dalmatian gum-diggers and on to today’s multinational corporations. Gibb sees dynamism everywhere in New Zealand wine and she doesn’t think this is likely to change. What would I change about The Wines of New Zealand? Well, the beginning of the book, a fantastic historical overview, is so strong that it makes the end feel a bit weak. Gibb’s final chapter does a great job informing the reader about Kiwi tourism opportunities — both wine and otherwise. But it doesn’t bring the book together the way I would like. What I’d really like to see — and maybe it will appear in the next edition? — is a chapter that draws together the many strands and looks ahead to where New Zealand wine is headed and what might stop it from getting there. That would end the book on the same dynamic note I enjoyed throughout. It would also make it a bit less of a reference book, which is its intended function. Maybe the best solution is to DIY — read this excellent book and then make up your mind where you think New Zealand wine is headed next! Highly recommended. We were sitting in the sleek, modern Vlassides Winery tasting the wonderful wines of Sophocles Vlassides and hearing his strong views on wine, Cypriot wine, and his own ambitious winery project, when it started to rain. Weather can be complicated in these mountains and soon the sun began to shine through the showers creating first a simple rainbow, then a richer multicolored arc, and finally a pair of rainbows nestled together. From our winery perch we could see both ends of the rainbow (where pots of gold are said to rest) firmly rooted in the vineyards below. Rainbow, vineyard, pot of gold — what a perfect metaphor for Cyprus wines, I thought. But the sharply analytical Sophocles Vlassides (who studied winemaking at UC Davis as a Fulbright Scholar) popped my mental bubble. Rainbows are pretty, but we were really looking at the wrong thing. If you want to understand Cyprus wine today, don’t look at the rainbows, look through them to the mountain across the valley. If you look through the rainbows on Sue’s photo above you will see the remnants of dozens of terraces that once were planted to vines that, along with hundreds of similar vineyard areas, formed the basis of the great Cyprus wine boom. I had never tasted a Cypriot wine before we arrived in Pafos for the Cyprus Wine Competition. You might not have tasted one either because most of the wines are consumed in Cyprus these days and only a trickle enters export market pipelines. But this wasn’t always the case. Cypriot wines were once well known and some even famous in European wine circles according to the Oxford Companion to Wine‘s history. Pliny the Elder, the Roman “Robert Parker,” praised them, for example. Cyprus fell under Venetian influence for a time and its wines circulated widely. I have a reproduction of a book called Wines of Cyprus by Giovanni Mariti that was written to explain Cypriot wine to international consumers. It is dated 1772. and was first published in Florence. Commandaria, Cyprus’s signature sweet wine, commands an important role in the country’s wine history. Indeed, Wines of Cyprus talks of little else. Along with Tokaj, Vin de Constance and a few other treasured sweet wines, Commandaria was a “King of Wines and Wine of Kings.” Ironically, my book was written during the period of Ottoman rule when the Cypriot wine trade and the industry itself slowly declined in importance. Cyprus came under British administration between 1878 and 1960 (so UK electrical plugs are needed and autos drive on the left side of the road). Cyprus “sherry” became an important export during this period — we saw a few old bottles at the Cyprus Wine Museum in Erimi Village — but this trade has faded away, too. A variety of circumstances led to a boom in production and export of cheap basic wines and grape must concentrate (some of which was reconstituted and fermented as British wine) in the years after the British exit. The grapes to make these wines (international and indigenous varieties) came from the vineyards we saw (and many others like them) when we looked through the rainbow at Vlassides. Yields might have been high in those days, but it is pretty clear that production costs were high, too. No machine harvesting on steep terraced slopes. The Cyprus export boom collapsed in two stages according to the industry people we talked with. Competition from cheaper New World producers such as Chile and Australia crowded Cypriot wine out of some markets. The collapse of the Soviet Union drained dry previously reliable Eastern European markets for basic wine. The Cypriot bulk wine boom went to bust. The movement from unmarketable quantity to desirable quality began in the 1980s, according to the Oxford Companion, led by the “Big 4” producers: KEO, SODAP (a cooperative), ETKO and Loel. Change accelerated after 2004 when Cyprus joined the European Union. Subsidies to cheap wine exports ended and uneconomic vineyards like the one we saw were grubbed up. The contrast between past and future was clear to see as we talked wine with Sophocles Vlassides at his modern facility tasting the tense, structured wines that he makes from international varieties (perhaps reflecting his UC Davis training) and indigenous varieties, too. Sue and I took home a bottle of his excellent Syrah and Panos Kakaviatos, who was in our media group, opted for an unexpected Sauvignon Blanc. What is the state of the Cyprus wine industry today? Are there pots of gold at the vineyard rainbow ends ? Or have I stretched this metaphor a bit too far? Come back in two weeks (after Independence Day) for observations and analysis. In the meantime, here are some rainbows for you to ponder. Lots of images come to mind when you think of Venice — the art, the architecture, and canals and gondolas. Vineyards? Not so much. Can’t imagine vineyards in Venice, although historians tell us that they were there — some even in the San Marco quarter — in earlier days when the city was less crowded and more concerned with self-sufficiency. Would you be surprised if I told you that there are still vines and wines in Venice today? Not on the cluster of islands that we think of as the city of Venice proper, but out in the busy lagoon? 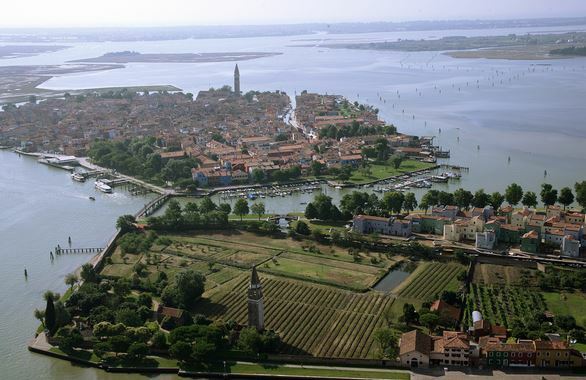 The photo above shows the island of Burano (the island of lace-makers to distinguish it from Murano, the island of glass-makers) and just below it, connected by a short bridge, is the island of Mazzorbo and the one hectare vineyard of Venissa. Dorona di Venezia is a grape of the Venetian lagoon. — its natural resistance to fungal diseases is a plus in this humid place. Known since the 15th century, it is a natural cross of Garganega and Bermestia Bianca (according to my copy of Wine Grapes) that is popular as a table grape because of its big sweet golden (D’oro) grapes. You can find Dorona here and there in the Veneto (easy to mistake it for Garganega, the grape most associated with Soave) but until recently not so much in Venice and its lagoon islands, the challenges of maritime grape-growing being what they are. 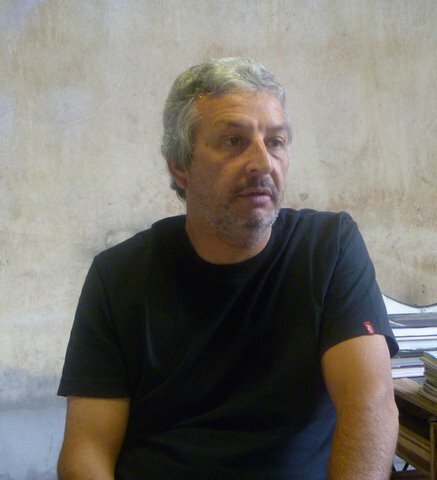 But Gianluca Bisol, of the famous Prosecco house, discovered a few vines on the island of Sant’Erasmo and used them to establish a Dorona vineyard on the old ScarpaVolo estate property on nearby Mazzorbo. Golden grape, golden wine. The wine really is golden due in part to fermentation on the grape skins to give it special character. The bottles of hand-crafted glass display rich decorations of hand-beaten gold foil (thus honoring two traditional Venetian crafts). The name Venissa and a number are carefully hand-etched on each bottle. What does it taste like? The note in Wine Grapes talks of minerality and dried peach and apricot. Only two vintages have been released so far — 2010 and 2011 — and Ian D’Agata writes in his excellent Native Wine Grapes of Italy that he prefers the freshness of the 2011. Winemakers Desiderio Bisol and Roberto Cipresso apparently pulled back from some of the extreme cellar practices after the first vintage, yielding a fresher wine, although not something that you would ever mistake for Soave! We loved the color of the wine and were surprised by its delicate aromas. I found a certain saltiness very appealing, although maybe that was the power of suggestion since we were tasting the wine with Matteo Bisol looking out at the vineyard and the lagoon just beyond. If there really is a salty character, the wine comes by it naturally. Salt water floods the vineyards during periodic tidal surges and a good deal of effort goes into drainage. I preferred the more intense 2010, but maybe that’s to be expected of the author of a book called Extreme Wine. Venissa has just released a red wine, Rosso Venissa, its handcrafted bottle suitably adorned by copper, not gold. It’s a blend of Merlot and Carmenere from 40-year old vines located on an island near Torcello. Sworn to secrecy, we tasted this wine prior to its official release and noted its richness, intensity and, well, salty personality. Not everyone would have seized the opportunity that those few stray Dorona vines presented, but Gianluca and now Matteo Bisol have done so and it is interesting to see the extremes that have resulted. The vineyard is a bit rustic, for example. Not the vines but the landscape, surrounded by stone walls, cut by drainage ditches and featuring a large rambling garden where local senior citizens grow vegetables that they sell to the Venissa restaurant. The restaurant and inn are as luxurious as the wine and present a strong contrast to the natural element that is appropriate for Venice. We dined at the restaurant and our waiter made the point that what came out of the kitchen (he pointed to the busy glass-walled show kitchen to our left) first came from the island and the lagoon to our right. 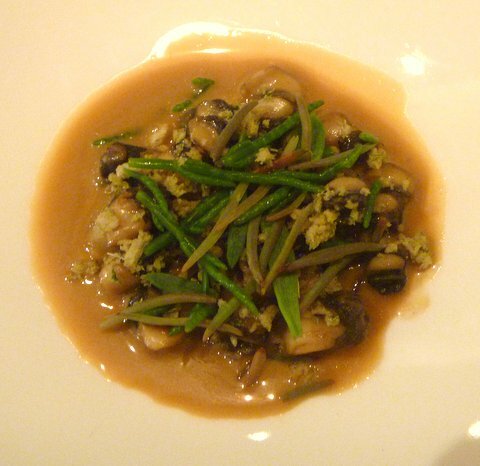 This locavore idea appeared in each plate we were served, perhaps most of all in a soup of sea-snail (garusoli) and sea fennel in what tasted like the rich reduced essence of the lagoon itself. Another extreme experience. On the ferry ride back to San Marco with the full moon above us, Sue and I talked about Venissa. I was suspicious at the start that it was a platform to promote the Bisol brand, but my hypothesis didn’t hold up. It really seems to be a sincere attempt by the Bisol family to honor the history and traditions of Venice and Venetian wine. What makes Venissa so interesting is the ambitious approach. It would be possible to draw attention to Venetian wine culture with a museum exhibition of some sort — many wineries display collections of winemaking implements, historical documents and wine and vine art. They are always interesting, but it seems to me that they usually lack the lasting impact that I see at Venissa. Why? One factor is that Venissa is a living exhibition — the actual vineyards are right here in the lagoon, not just dots on an old map and the actual wine is in your glass not a just label on the wall. This obviously creates a more intense sensual experience. And the total project reinforces this by drawing on all the senses through the packaging, the location, the inn and restaurant and so forth. 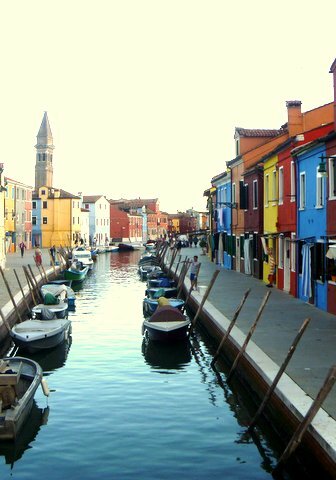 Matteo told us that there are plans to further extend the experience through a sort of deconstructed hotel project on the neighboring island of Burano. The “hotel” would actually be a collection of rooms scattered around in various of the buildings that line the colorful canals of the little island, giving visitors an opportunity to intimately experience a different side of Venice and of course to enjoy the short stroll over the little bridge to Mazzorbo, then on through the vineyard and to Venissa itself. Venissa is a wine, a destination and a statement, all made with impressive clarity and commitment. Congratulations to the Bisol family on this achievement. Ian Mount, The Vineyard at the End of the World: Maverick Winemakers and the Rebirth of Malbec. Norton: 2011. The most stunningly creative student paper I’ve received in more than 30 years as a college professor was written by a first year student enrolled in my introductory International Political Economy class. 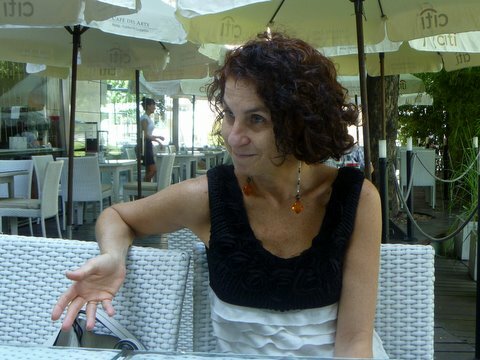 We were studying Argentina’s latest financial crisis and she analyzed the situation not just through facts and figures but rather by telling the story of Diego Maradona, the legendary soccer player who achieved great success on the global stage but succumbed to the pressures, stresses and temptations that came with it. Maradona is always measured against Pele, the Brazilian star who is often proclaimed the greatest soccer player in history, and every talented young Argentinean forward is compared to him (Messi is only the latest “next Maradona”). But an air of tragedy is unmistakable despite Maradona’s heroic achievements. This same air, my student wrote, hangs over Argentina’s politics and economy, and then she proceeded to analyze Argentina’s political economy history in detail in terms of the Maradona story. It was, in both conception and execution, a brilliant analysis. Ian Mount’s new book on Argentinean wine, The Vineyard at the End of the World, is also brilliant and in much the same way. Like my student’s paper, it can be read at several levels. It is, first and foremost, a history of the Argentinean wine industry from its roots with the Spanish explorers to its current spectacular flowering. Although Argentina has been a major wine producer for literally centuries, it has only arrived on the global stage in the last ten years. Within Argentina its long history is heavy baggage that sometimes weighs it down. For the rest of the world, however, Argentina is a new discovery and the lack of prior experience of and attitudes toward its wines has arguably been an advantage. Mount fills us in on the history and serious readers will appreciate the added depth this gives to the appreciation of the wines themselves. It also provides an interesting contrast to neighboring Chile and its wines, whose history is perhaps better known. But that’s only the beginning. Malbec is a second theme, which is understandable because Malbec is king in Argentina right now. Malbec from Argentina has been one of the hottest product categories in the U.S. wine market is the past few years. But today’s Malbec (like Maradona) is a lucky survivor of Argentina’s booms and busts – a lot of Malbec was grubbed up during the market swings and swirls. It makes me appreciate wines (like one of our favorites, Mendel Malbec) that are made from the surviving old vine blocks. More than anything, however, this is a history of Argentina itself told through wine, making this a book that deserves a very broad readership. Based on my previous research, I knew that Argentina’s politics and economics were reflected in the wine industry, but I didn’t know how much. Come for the Malbec, stay for the politics, economics and personal stories of those who succeeded or failed (or did both) and try to understand the country and people of Argentina. Significantly, the book ends with a sort of Maradona moment. In terms of wine, Argentina has won the World Cup with Malbec, although the country must share the glory with international consultants (like Paul Hobbs and Michel Rolland) and foreign investors and partners (too numerous to mention). But for all its strengths the industry is still somewhat fragile, struggling to overcome the problems of the domestic wine market that it still depends upon and the domestic economy in which it is embedded. 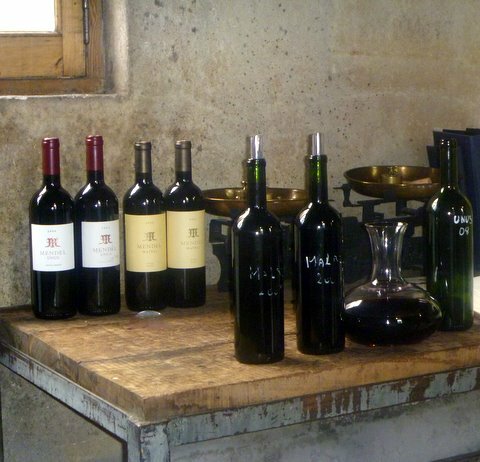 After decades of “crisis and glory,” Mount sees a bright future for both Malbec and Argentina. Let’s hope he’s right and the Maradona moment passes. Ian Mount’s new book is a valuable addition to any wine enthusiast’s library. Mount provides a strong sense of the land and people of Argentina and the flow of history that connects them. 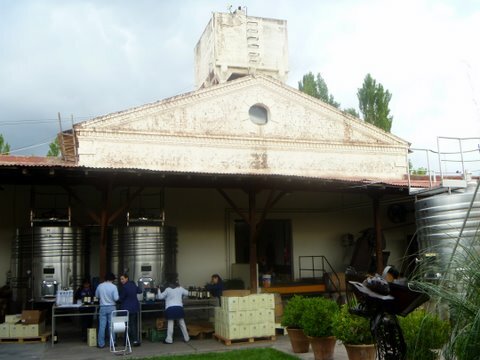 Argentina is unique, as Mount notes early on, in that it is an Old World wine country (in terms of the nature of its wine culture) set in the New World, so that its history is broadly relevant and deeply interesting. I studied the Argentina industry before going there last year, but Mount taught me things I didn’t know in every chapter. I love Laura Catena’s Vino Argentino for its account of the history of wine in Argentina told through the Catena family story and now I’m glad to also have The Vineyard at the End of the World for its broad sweep and detailed analysis. They are must reading for anyone with an interest in Argentina and its wines. Another Malbec-Maradona connection: Diego Maradona is most famous for a play that has gone down in soccer history as “the Hand of God” goal. It was in a 1986 World Cup quarterfinal match that Maradona illegally struck the ball with his hand and scored the winning goal – an offense that was clearly visible to everyone in the stadium except the officials. Must have been the Hand of God, not Maradona, I guess. Special thanks to Jon Staenberg (proprietor of Hand of God) and Santiago Achaval for letting us sample this wine! For a long time nobody really knew much about Petite Sirah (PS), except the fact that it produced “the biggest, toughest, brawniest red wines in California” (according to The New Connoisseurs’ Guidebook to California Wine & Wineries). It’s true identity was a hotly disputed mystery. DNA tests finally settled arguments about its parentage — it is the Durif grape from France, a combination of the Peloursin and Syrah varieties discovered by Dr. Francoise Durif in the 1880s when he was searching for solutions to Syrah’s powdery mildew problem. It never caught on in Europe, but PS was quickly embraced in California and South America, where it thrives. Many of the early California vineyards included Petite Sirah along with Zinfandel and other heat-loving varieties and it figured prominently in field blends. If you’ve tasted Ridge Lytton Springs (71% Zinfandel, 21% Petite Sirah, 5% Carignane in the 2008 blend) or Frog’s Leap Napa Zin (80% Zinfandel, 19% Petite Sirah, 1% Carignane in 2008) you have some idea of what I’m talking about. So valuable was Prohibition Petite Sirah that in 1934 PS vines accounted for 4400 of Napa Valley’s 11,000 vineyard acres! The total for all of California was 7,285 acres in 1938. Petite Sirah went into decline again in the postwar years, as winemakers realized that it was not really Syrah after all as some supposed and moved in other directions. The spike in the 1960s and 1970s in the chart above is driven in part by the increase in generic jug wine sales (think Gallo Hearty Burgundy). A lot of the “Burgundy” in those blends was really Petite Sirah. Do you see the “I can’t get no respect” angle here. Poor, misunderstood, mislabeled Petite Sirah. But Petite Sirah is experiencing a renaissance today as a varietal wine as well as a blending component. PS vineyard acreage is up as is the number of wineries making varietal PS. There is even a very dynamic advocacy group called PS I Love You that promotes the wine. Why Petite Sirah now? Well, one reason is that it is different at a time when a lot of wines taste the same. Many of the old PS vineyards survive, so old vine PS is available, which is a special treat. Sue and I enjoyed a bottle of 2005 Arger Martucci Petite Syrah made from 140 year old Calistoga vines for our last wedding anniversary. That’s not an experience you can get with many other wine varieties. But there is more than longevity to Petite Sirah. I asked Julie Johnson of Tres Sabores to explain the appeal and here’s what she said. The old timers planted PS because they loved it and it happened to blend particularly well with Zinfandel. That’s why I planted it: a really old timer shared with me that he remembered it being planted on our property long, long ago. I’m determined to continue making PS in an open and fruit forward style—some versions have gotten quite alcoholic and leathery (not unlike Zinfandel) but I think that people are loving the depth and zest that the grape puts forward (sort of like Syrah +). … But in general, I think it’s a perfect wine for the rather amazing charcuterie and “all things from every animal” cuisine that’s so the rage right now. People are discovering that it can be made without terribly extracted tannins as well so that helps the pairing—even with cheese. At the winery–I offer guests a tasting choice–they can taste PS with a rich chocolate (70% +/-) cookie/cracker (not very sweet, nice texture) or a lovely piece of salumi. It’s kind of fun for people to delve into why aspects of each food pair well. My main source of PS is up in Calistoga. Dry farmed and always in need of a major taming of the crop —I love it. Another reason for the PS Renaissance is that makers of this variety have come out of the closet, so to speak, and begun to celebrate the grape and their wine through the PS I Love You advocacy group and events like Dark & Delicious, which was held at the Rock Wall winery in Alameda, California a few weeks ago. I couldn’t attend the big tasting (I was in Argentina), so I asked my good friend Lowell Daun to fill in for me. Here is his report. If turnout is any indication, I think Petite Sirah production will have to get back to the 1970s numbers – the place was not easy to find, the weather was abysmal, tickets cost $63, yet the place was absolutely packed! I would estimate between 800 – 1000 people participated. And of the many wine tasting events I’ve attended, this group seemed more enthusiastic than any I’ve seen. And it wasn’t a “drunk-fest”, rather oenophiles whom seemed to know what they were looking for,enjoying and analyzing. “Accidental Pairings” was my assumption upon finding some unusual wine-food combinations set throughout the Rock Wall facility. In retrospect, I think the organizers are too smart to have not had some design as to where each winery and food purveyor were located. … Many chocolate pairings made sense, but I was surprised to find wonderful cupcakes worked with the wines, too. The most unusual food being paired with P.S., was spicy bacon and almond caramel popcorn, by HobNob Foods, set next to Tres Sabores’ pouring station. As it turned out Tres Sabores poured my favorite wines and the spicy bacon-almond-caramel popcorn was my hands-down favorite food, and they paired perfectly!! In addition to hands-down favorite, Tre Sabores, other very interesting pourings were: Biale’s Punisher, Clayhouse, Rosenblum’s Rock Pile, Silkwood, Aver Family and Cecchetti. Lowell did have one reservation. A health professional, he was concerned about all the purple smiles he saw at Dark & Delicious — Petite Sirah is famous for its ability to stain tooth and tongue. Is PS a threat to your tooth enamel? Click here to read the 30 Second Wine Advisor on red wine and your teeth. I think that all this proves that Petite Sirah really is the Rodney Dangerfield of wine — and I mean that in a good way. It may not be The Next Big Thing, but that’s not the point. Different and not to everyone’s taste, but with a large, loyal and growing fan club, that’s Petite Sirah. Thanks to Jo Diaz of Diaz Communications for information about the PS I Love You program and for the charts above. Thanks as well to Julie Johnson for her comments on PS and to Lowell Daun and Miller Freeman III for representing The Wine Economist at the Dark & Delicious tasting. This is the seventh in a series of articles on wine in the BRICs and the New BRICs. Today we examine Mexico & Turkey. From a wine standpoint, Mexico and Turkey are linked by the term “oldest.” Turkey may be the oldest Old World wine producer, with evidence of wine production going back more than 6000 years. You cannot get much more “Old World” wine than Turkey, even if most people in the Old World never give Turkish wine a second thought. Mexico is the oldest wine producer in the New World. Spanish soldiers and priests brought wine grapes with them, The first evidence of wine production dates from 1521 (I see a 500 year anniversary celebration on the horizon). Conquistador Cortés ordered that new settlers plant grape vines (1000 vines for every 100 persons, according to the Oxford Companion to Wine), thus spreading Spain’s wine culture throughout the New World empire. Wine production in Mexico grew so successful that King Felipe II of Spain order a stop to new production in 1699 in an effort to protect Spain’s domestic wine industry. It is ironic that we don’t associate wine production with these two countries today given their deep historical roots. Turkey? It’s a Muslim country, of course, so we don’t think of alcohol or, if we do, it is raki, the fiery anise flavored drink. Mexico brings images of tequila (and wasting away in Margaritaville), beer, and perhaps Mexican brandy, the national liquor. Casa Pedro Domecq’s Presidente brand is said to be the best selling brandy in the world. Domecq is now part of the French drinks group Pernod Ricard. Both Mexico and Turkey are important grape and wine producing nations today. 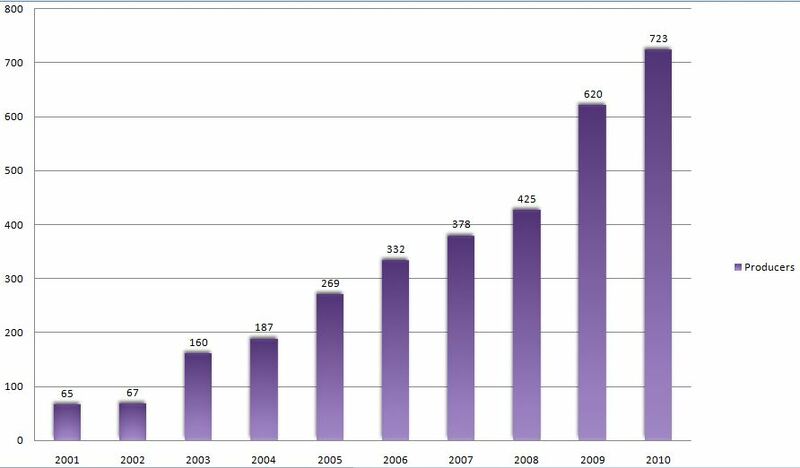 Mexico produced a little over 1 million hectoliters of wine in 2007 according to OIV data — about as about as much as New Zealand made in 2005 before its recent boom. Turkey is the world’s sixth largest table grape producer, surpassing Italy in this area, but only a small fraction of its output is made into wine. Turkey makes roughly the same amount of wine (213,000 hl) as Israel (218,000 hl). 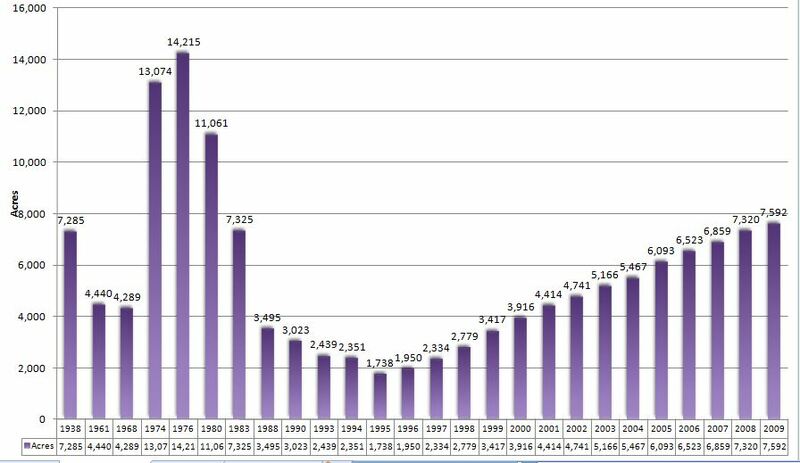 Wine production in Mexico has fallen by almost 50% since the 1980s according to the OIV records while Turkey’s production levels have been more stable. Both Turkey and Mexico have the potential to rise up in the world wine rankings, but they each face particular challenges. Turkish wines can be stunningly good. Jancis Robinson’s tasting notes (from a 2009 research trip) find many peaks among wines make from international grape varieties. A Corvus Corpus 2004 received a rating of 17/20, for example. “This right bank style wine is really quite rich and full, verging on overripe. Extremely opulent and velvety.” A Robert Parker kinda wine, she said. Ron and Mary Thomas, my senior Turkish wine correspondents, reported similar success on their 2010 tasting trip. “We found the wines of Turkey to be ubiquitous, great values, and extremely enjoyable,” they write. Among the reds they found the Syrah wines hard to beat — some of the best Syrahs they have tasted anywhere — high praise. But the highest peak came from an unexpected source. Our greatest discovery was the varietal called Emir. We found it from several different producers in each area of Turkey where we stayed, most of the producers (or the fruit) located in the area we first stayed (Cappadocia—central Turkey). This stony, flinty land produced this wonderful grape that is unlike anything I’ve tasted. Think about a cross between a flinty sauvignon blanc from the Loire and a very dry viognier. It had a light golden color and a very crisp finish. Some lemony-apple notes, wonderful minerality, and pleasing to sip while it stood up well to fish and the ever-present smoky-roasted aubergine (which I had at every meal in Turkey). This was a favorite wine we would drink anytime. We found the same bottles to cost anywhere from about 15 Turkish Lire in the winery, to 30-90 in a restaurant (depending on the scale of the restaurant). That’s a range of about $10 USD to $65. We sometimes did not find it on the wine list, and started asking for it: in all cases but one, they found a bottle in the back and presented it to us, and no matter who produced it, it was great. It went beautifully with the bronzino in Ephesus and Istanbul, and was perfect with the stuffed zucchini flowers in Cappadocia. Emir is king. Indeed. And that’s part of Turkey’s problem. As the Oldest of the Old World countries, it has perhaps the richest treasury of native grape varieties. But who has heard of them, of King Emir and his court? Very few, I think, and this is problematic in a world where so many consumers are already confused by wine and have trouble mastering the basics. The domestic market for wine in Turkey is relatively small and its international exports are limited. Belgium is its largest international customer according to a government report (Belgium?) followed by Northern Cyprus, Germany, Britain, the USA and Japan. A local search for Turkish wine uncovered a few bottles at a Mediterranean restaurant and not much else. As the report says, there is much work to do for Turkey to realize its great wine potential. Very Mexican! I like that. Not a me-too wine. Not all the wines are big or sweet, of course, which is just as well. Lots of variety. Lots to look for and to like. The biggest challenge? Climate, according to Jancis. Not enough rain. And, while I’m sure she is right in the long run, I think that infrastructure is probably an even bigger short term problem. People who taste the wines of Mexico at wineries rave about their quality. But then when they order them in restaurants in the cities they are sometimes puzzled. Is this the wine I liked so well? I wonder what’s happened to it, they ask? The answer, in many cases, is that Mexico’s transportation system of poor roads and long rides in hot trucks has baked the freshness out of the wine and left just a hollow shell behind. Mexico can produce excellent wines, but it must also find ways to get them to market in good condition. This is a wine problem but of course it is much more than that. It is a symptom of a general challenge to Mexico’s continued development.